The last time we had been to Italy was almost 6 years ago, and we were traveling by train in the north. Longing to get back to one of our favorite places in Europe, see the sun and get in some much-needed winter bicycle touring over the New Year’s holiday, we left the snows of Warsaw behind for the sunny rolling roads of Southern Italy. Over two weeks we traveled from Rome to Naples and the Amalfi Coast by bicycle and back to Rome by train. The warm Italian winter sun was the perfect antidote for the pending wintertime blues that usually set in this time of year. Warsaw’s streets are covered in an icy, slushy mess, and the sun only makes a brief appearance, if at all. On New Year’s eve we flew with our bikes from Warsaw to Rome. Stepping off the plane in Rome, was like landing on another planet. 15C and sunny. Clearly the Romans don’t realize how good they have it, as several folks commented to us how cold it was. We were smiling all the way to our hostel. Biking in the warm winter sun. Southern Italy. On this trip we added a third wheel, so to speak, to our mix with Carolyn’s son, Casey, along for the trip. 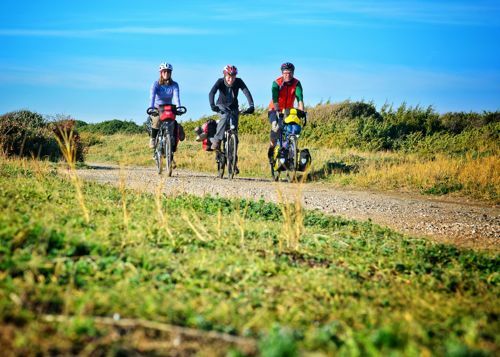 Although he’s been an avid cyclist since the age of ten, this was his first multi-day bicycle travel experience. 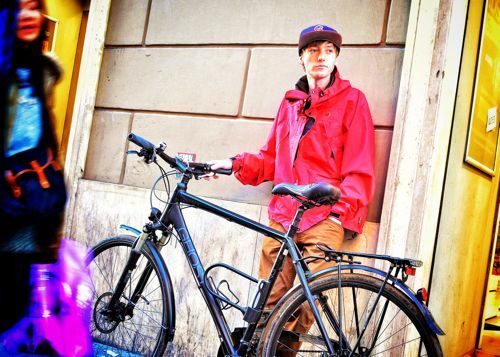 And since he doesn’t have a bike up to the task, we arranged a rental touring bike from Top Bikes in Rome. Rental bike in hand and minor mechanical obstacles sorted, we left Rome under a foggy morning sky. We pedaled past the Colosseum and south on Via Appia Antica (literally the oldest paved road in the Western World). The first day out on any tour always makes me a bit anxious because we almost always get lost leaving a unfamiliar city. Fortunately, we made it out of Rome with only minor directional mis-steps and soon we were rolling in bright sunlight and through the coastal hills with the sea breeze in our faces. 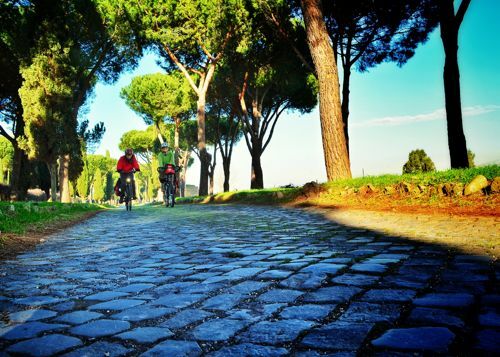 Biking Via Appia Antica south from Rome. Welcome to the South-it’s different from the North! As those who know Italy can attest, the South is quite different from the North. 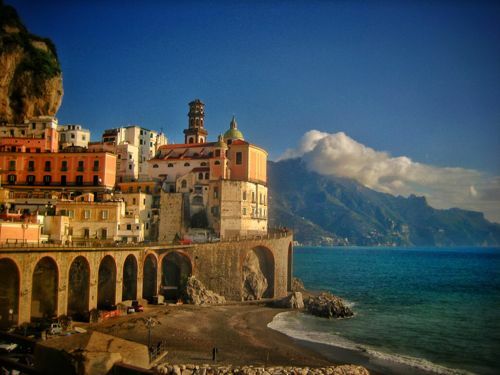 Traditionally, Southern Italy was economically poorer, while being culturally rich. And, of course, it is the birthplace of some of the most wonderful food the world has ever known. As we found along this trip, often those old stereotypes still hold true. The cities and towns are far less grand than those of the North, but still full of a unique charm in most cases. The people of the South are as warm, welcoming and kind as the climate they come from. 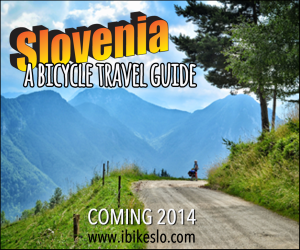 But how does it stack up as bicycle touring destination? While we were generally pleased with our choice of routes, ending along the Amalfi Coast – one of the most spectacular cycling sections we’ve ever seen – there are a few sections which might be less than exciting for the most purist of bicycle tourists seeking only amazing views and landscapes. Yet, these less-than-exciting places are equally intriguing for their juxtaposition against the more dramatic parts. And they are far outweighed by the beauty of cycling along the seaside with the sun in your face during January. Despite the changing landscape, the people remained friendly, helpful and often intrigued by packed-down cyclists in the land of roadies. Sun, sight-seeing, good food and incredible vistas! Our route took us from Rome-Anzio-Gaeta-Pozzouli-Naples-Sorrento-Amailfi-Salerno and back to Rome by train. (See our full Southern Italy trip journal for the nitty-gritty details). 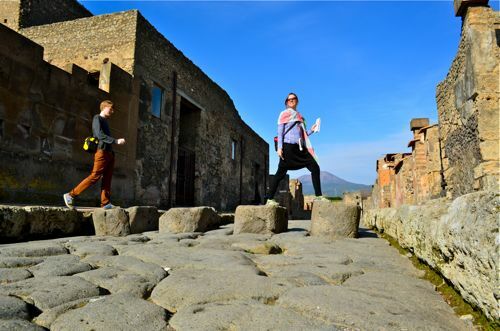 A total of 2 weeks door to door with 8 days on the bike, 1 sightseeing day in Pompeii, and a couple of days poking around Rome. The roadways were largely quiet, except in and out of Naples. Several times we were surrounded by large groups of Italian Cycling Teams in their winter training grounds. 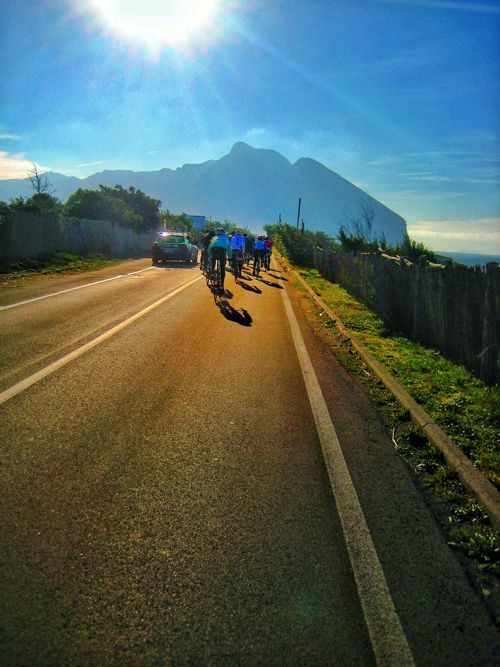 Southern Italian winter is far milder than most of Europe so this is the ideal place to come for winter bike travel. Bicycle touring in Italy this time of year has advantages beyond just sun. Accommodations were never full making lodging easy to book, and we took advantage of the off-season pricing that made this a more affordable Italian holiday than in the high season. We were able to score some remarkable lodging at bargain prices, in some pretty sweet locations. Something we might not be able to do in the summer without booking far in advance. Loads of history right at our fingertips. We stopped several times each day to check out ancient dwellings, structures, sections of aqueduct, etc…Italy is like a living museum. There is almost no place that doesn’t hold some historic significance in the development of the Western World. Is this going to be on the test? 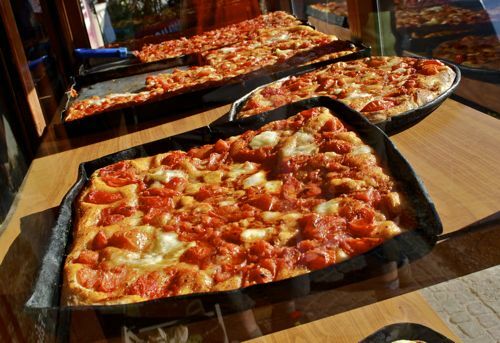 Pizza – breakfast, lunch and dinner. The perfect cycling food. 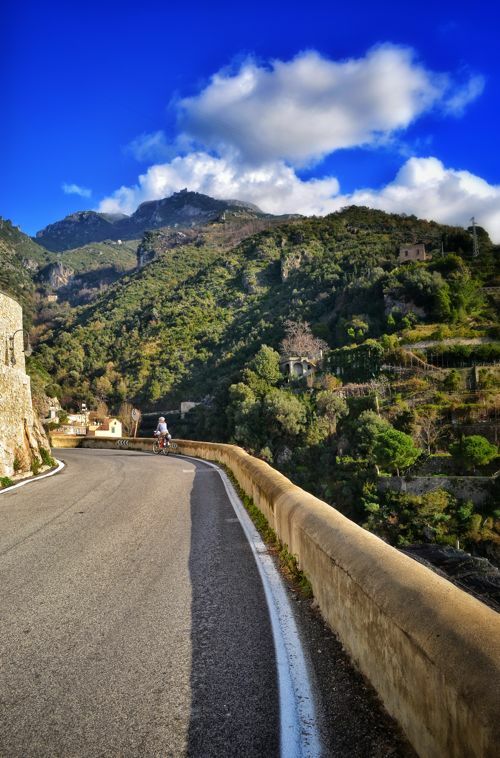 The Amalfi Coast is possibly one of the most spectacular sections of road we have ever pedaled. Winter is the perfect time to bicycle this section, since in the summer it is jammed with tour busses, private cars and thousands of sightseers. We largely had this section ourselves. Stopping sometimes in the middle of the road to shoot photographs or simply stare out over the Mediterranean Sea. It was breathtaking. Italy has so much to offer and we only scratched the surface on this trip. Winter is a great time to tour the southern reaches with warm temps, off-season pricing and all the beauty that is Italy. We can’t wait to return. Oh wow! I would love to take a trip in Italy in the future. It’s on my bucket list. It looks like you had an amazing trip! Don’t wait. Go! You’ll be glad you did. Biking in Southern Italy is amazing, especially in the Puglia region also known as Salento. I agree with Tyler that the best time to go is in the off season, since it is much less crowded and still beautiful weather wise. I recently had the opportunity to do a few full day trips with In the region with Salento Bici Tour (salentobicitour.org) and they were absolutely amazing. Although tracking on my own is a nice idea, having someone who knew the region with all of its hidden local secrets ( and AMAZING food stops!!!) was priceless. They also have great bikes so I didn’t have to worry about lugging mine from California! Great. Next time return in other Southern Italy: Puglia and Salento!!!! Which hostel did you stay in Rome? Trying to find one for my son this week that has secure place for 4 bikes while they sightsee. Also do you know how to get from centre of Rome to Ciampino airport with a packed bike box…will the transfer bus accept it as luggage? Thanks for any help. I traveled in Rome with my bike and I had a problem with pedals. I was like to fix it to roma rent bike. Where I came back also to rent a bicycle for a friend the day after. Rome is a very nice city not hard to ride.